The ear is one of those areas that seems simple enough to draw, but on closer examination it turns out to be a fairly complex form. Like other features, ears are different on everyone. They may be shaped different, some short and curled, others long and flat. They may stick out or lay pressed against the head. Earlobes even vary in shape. The right ear can vary from the left ear on an individual as well. Yet, even with the great variety in ear shape and size, there are some characteristics of the ear that are similar from person to person. These characteristics are what we can identify as key components of an ear. We use these components to workout the shapes and structures within the ear. Today, we will look at the anatomy of the ear to see the basic shapes, structures, and forms the ear creates. 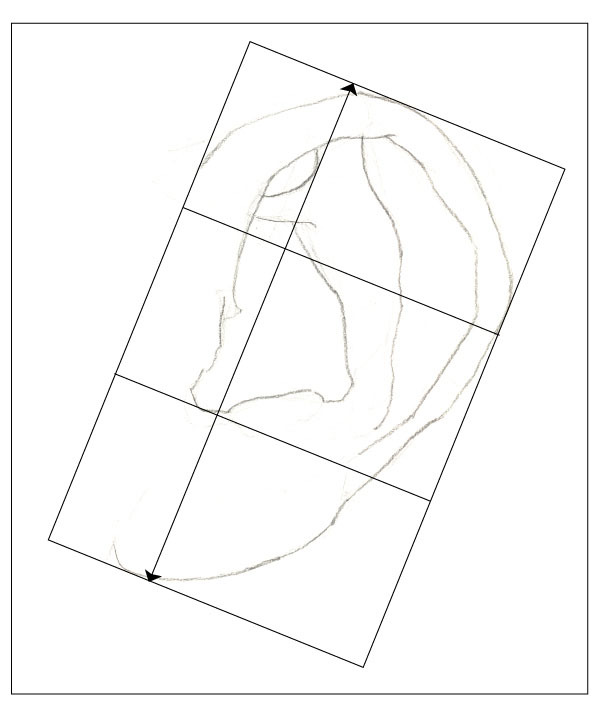 Before we look at the shapes of the ear we should decide where to place it. I like to find where the ear should go by looking for the placement of the opening of the ear. This is a better landmark to work from than the outer edges of the ear because ears vary in size and this makes the top and bottom of the ears unreliable guides for general placement. 1. 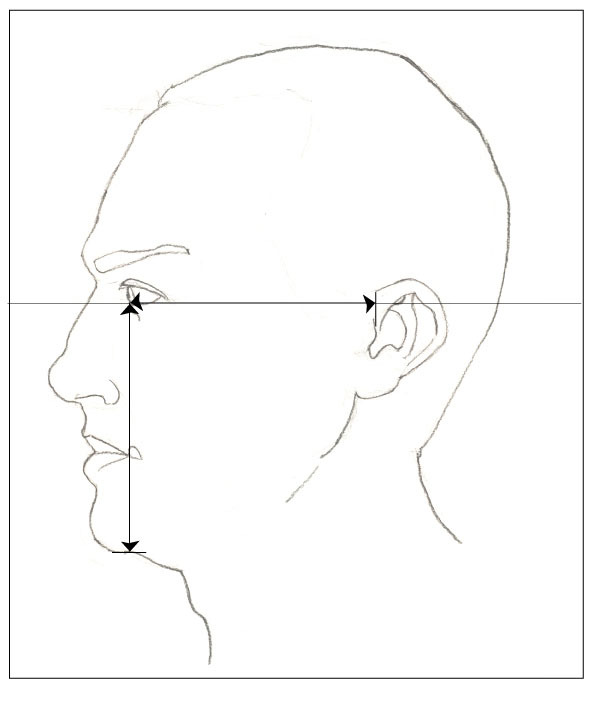 From a profile view, the distance from the tear duct of the eye to the opening of the ear is the same distance from the tear duct of the eye to the bottom of the chin. 2. 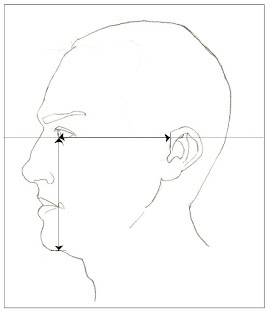 The opening of the ear is below the eye line of your subject. If working from a model, sight measure the distance to the opening from the eye level of the model. Notice that the ear is not positioned perpendicular to the eye line on the head. The ear tilts back slightly. The top of the ear starts slightly further back on the head than where the earlobe starts. To the right we can see an ear with the major anatomical structures labeled. Starting at the top of the ear is the helix. 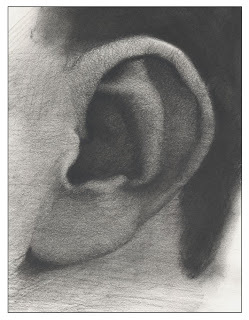 This is the curled ridge of the ear that wraps around and makes the outermost fold of the ear. Just underneath the helix sit the scapha and the anti-helix. 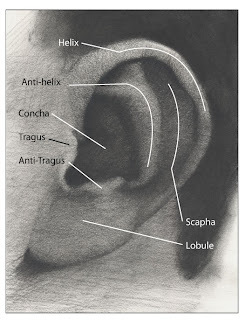 The anti-helix is the Y-shaped structure made of cartilage that starts under the helix and runs down the ear to near the opening of the ear (near the anti-tragus) The scapha is the area between the helix and and anti-helix and is also made of cartilage. 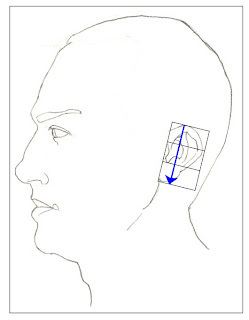 Below the anti-helix are the concha, these are the areas near the opening of the ear that forms the cup shape between the opening and the rest of the ear. Next we can see the tragus and anti-tragus. The tragus is the protrusion of the ear next to the opening that meets with the side of the face. It is made up of two little pieces of cartilage. The anti-tragus is the protrusion on the opposite side of the opening, also made of cartilage. Finally there is the lobule, also called the earlobe. This part of the ear contains no cartilage. Some earlobes are considered to be what is called connected earlobes. This means that the earlobe will not hang down below where the ear meets the head. An earlobe is considered not to be a connected earlobe when the lobule hangs slightly past that connection. 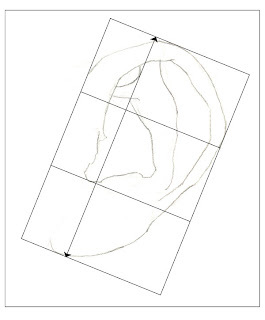 We can use this information to identify the shapes of the ear and draw the forms combining our anatomical knowledge with the details of the ear we are looking at. The ear can be roughly broken into thirds from top to bottom. Remember that there is variation between ears, so this will fluctuate a little. The top third roughly consists of the helix, the scapha, and the top of the Y of the anti-helix. The middle third consists of the concha, tragus, anti-tragus, the bottom of the helix, the anti-helix, and the opening of the ear. The bottom third consists of the earlobe. Finding the structure and anatomy of the ear will help clarify the shapes and forms of the ear as we examine the model. This will make it easier to draw an ear. I love your paintings too. They are very nostalgic.